View More In Swizzle Sticks. Perfect for hot and cold beverages! Use these wood stirrers to mix in milk, sugar, or cream into coffee or tea. Also great for stirring sugar into iced tea! An ideal item for the office, coffee shops, cafeterias, restaurants, at home, and more! These coffee stirrers are made entirely out of white birch wood. They are designed to be a one-time use only item, and are biodegradable. They can be thrown out with food waste. These wooden stirrers offer great resistance to expansion and contraction. They will not splinter or shred, and do not transfer wood taste to beverages. They are an economical alternative to bamboo stirrers. HIGH-QUALITY AND DURABLE! 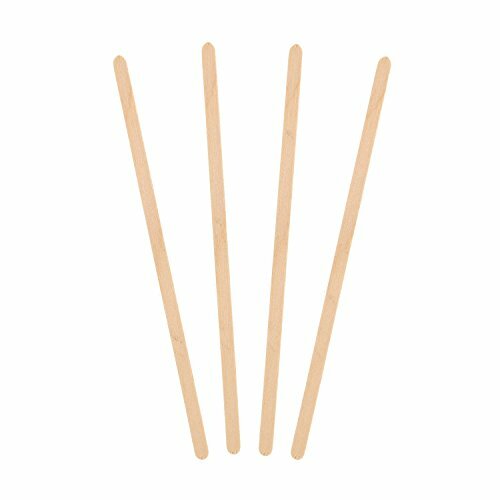 These wooden coffee stirrers are high quality, and will not shred or splinter. No splinters or pieces of wood in your beverage or mouth! Wooden stirrers are an economical alternative to bamboo stirrers. STIR HOT BEVERAGES! These stirrers are designed for stirring in milk, cream, or sugar. Wood can handle the high heat of beverages without transferring any wood taste. ECO-FRIENDLY! These stirrers are made from 100 percent white birch wood. Made from a renewable resource, wooden stirrers are more eco-friendly than plastic stirrers. They are biodegradable, and can be thrown out with food waste. CONVENIENT PRODUCT! As a one-time use product, these stirrers offer convenience. Save time and water by not having to wash spoons! This product is 7" in length, .25" wide, and 1/16" thick. ESSENTIAL ITEM for coffee shops, restaurants, and cafeterias! Customers will appreciate the convenience of having stir sticks readily available for their cups of coffee or tea. Staff will love the easy convenience of clean-up with this disposable item!